If you love soft chewy chocolate chip cookies this is the recipe for you! 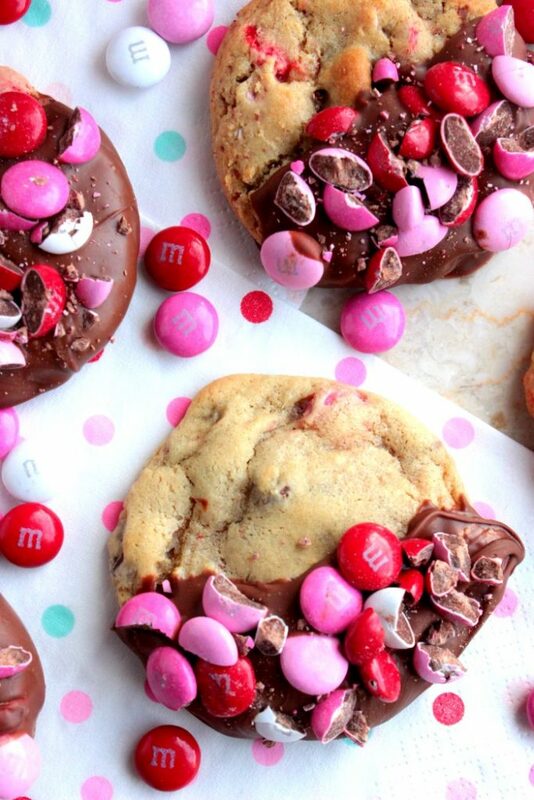 These Chocolate Dipped Chocolate Chip M&M Cookies are amazing! 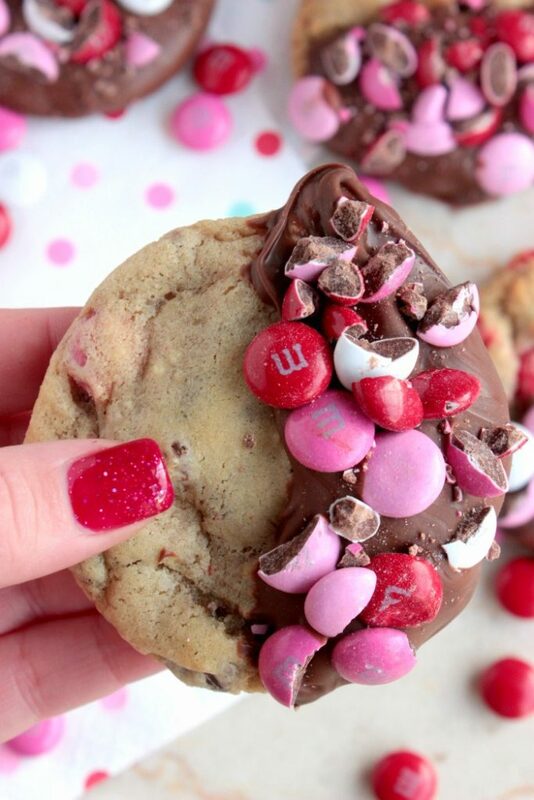 They would be perfect for you Valentine or anyone that loves cookies! What a special day today is. Oh I know it’s not Valentines day yet but today is even more special to me. Today is our 10th Wedding Anniversary!!! That’s right y’all. As of today, Thomas and I have been married for 10 years!! How is that even possible. I feel like we just started dating the other week! But it’s true. Ten years ago we stood at the alter and said, “I do” before starting this amazing life together. 10 Years! 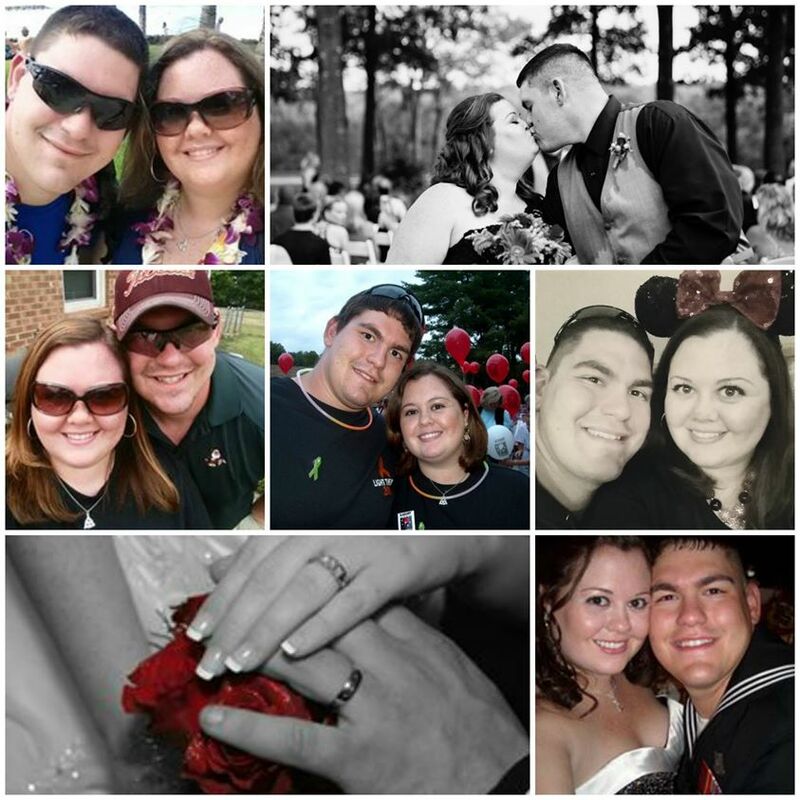 10 years ago we said “I do” <3 As of today I have been married to the love of my life for 10 amazing, wonderful, special years. Who would have known that a simple “Hey” would lead to so much. I am blessed to call him mine. Happy 10th Anniversary Thomas! I love you! So today’s post has two missions. One reason is to celebrate our 10th wedding anniversary. The other reason is to bring some attention to the cause, “Cookies for Kid’s Cancer“. Julie from The Little Kitchen started a cookie swap back in 2011 to help raise money for Cookies for Kid’s Cancer, I participated in the swaps a few years and I think it’s such a great cause to be involved with! 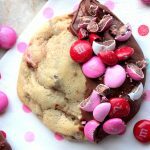 Julie, Myself and a ton of other bloggers are donating to the Cookies for Kid’s Cancer cause and posting Valentines day cookie recipes for y’all! Did you know that cancer is the #1 cause of death of children by disease in the U.S.? There are 40,000 U.S. children actively battling cancer right now. It breaks my heart. The deadline for donation is February 28th, so we have the month of February to finish raising $3000! We can do this with your help! Currently, we have raised: $1,665 we are a little over HALF WAY towards our $3000 goal, will you help us with a donation today? Every little bit helps! In a mixer cream the soft butter, brown sugar and white sugar together. Mix well. Add the vanilla. Mix until everything is mixed well. Mix in M&MS. (2 cups) Add in the chocolate chips and mix well. Drop by rounded tablespoons onto a baking sheet. Bake at 350 F for 10-12 minutes. Remove and let cool on baking sheet for 15-20 minutes before moving to rack to cool. Once completely cool, melt the chocolate according to package direction and dip half of the cookie into the chocolate. Lay on wax paper and sprinkle the wet chocolate with crushed M&Ms. Let the chocolate harden before moving. Bake these for 10-12 minutes or until the shine is gone but they still look under-cooked. Once they get to that point, remove them from the oven and let them cool on the baking tray for 15-20 minutes before moving them to a cooling rack. They\'ll finish cooking a little even after you remove them from the oven BUT they\'ll be way too soft touch until they\'ve rested. After 15-20 minutes, use a spatula and carefully remove them and place then on a wire rack to cool completely. 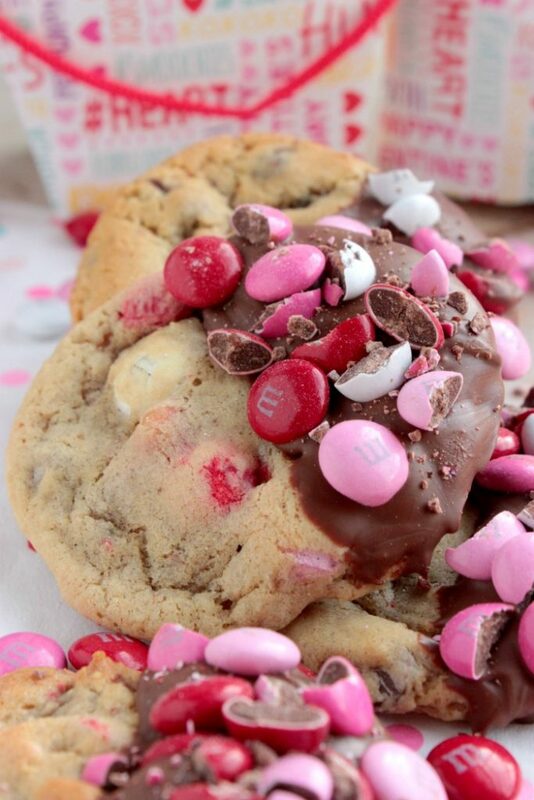 This will give you that perfectly soft, melt in your mouth chocolate chip cookie. Don\'t rush these. These aren\'t going to take forever to make BUT they\'re not like the slice, bake and be done in 10 minute type of cookies. They\'re going to need you to have a little patience but oh it\'ll be worth it! Once they\'re completely cool, dip them into the melted chocolate and immediately sprinkle chopped chopped M&Ms onto the chocolate before it hardens! Lay them on wax paper so that the chocolate can firm up. Yum! So festive! Congrats on the wedding anniversary! Such a fun loving idea! I wish I cold reach through the screen!! I may make these and keep them all to myself! What a great cause and happy anniversary! And such fun cookies, too! These are adorable! 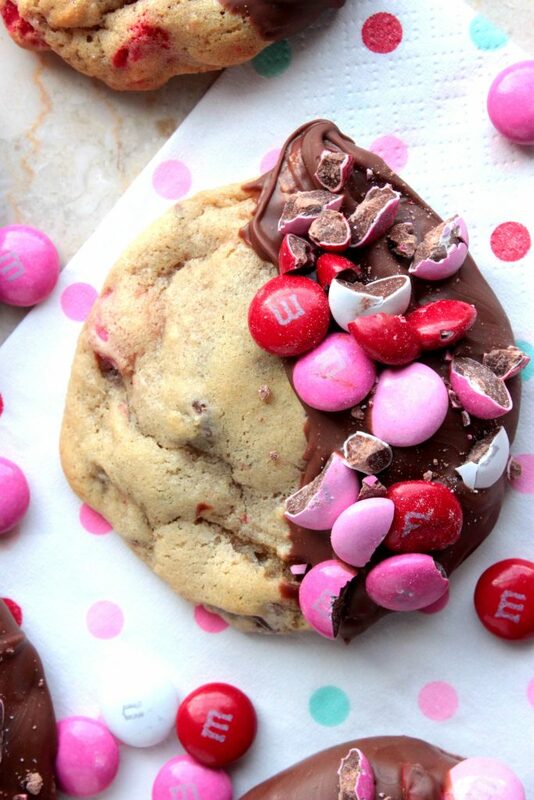 Love the fact the M&Ms add a crunch in contrast to the chewy cookie. What a delicious twist on normal chocolate chip cookies! Happy Anniversary too! Congrats on your anniversary! 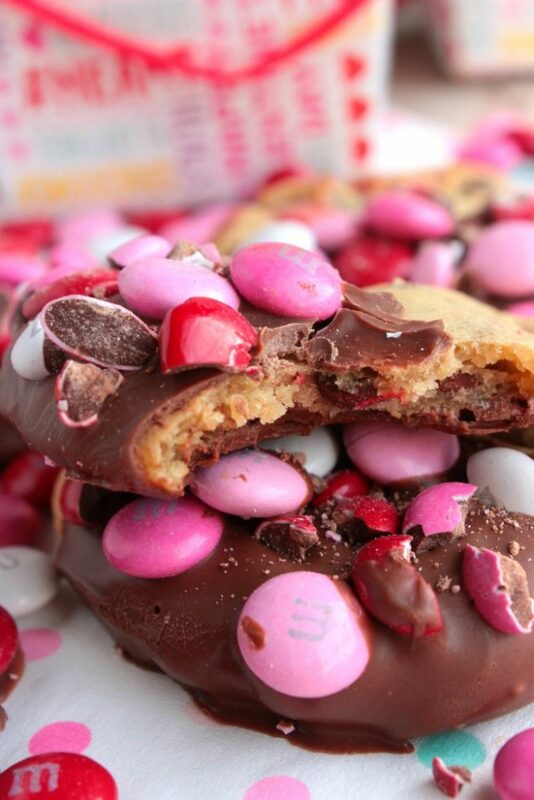 Why just eat a cookie with some M and Ms when you can have them together?